Joanne Weir Gets Fresh carries forward the success of her previous award-winning PBS TV series “Joanne Weir’s Cooking Confidence” with 15 brand new shows. That’s right Katy, dig in! Serious salmon fishing in Alaska. Joanne Weir is back and ready to get fresh with a brand new series! The award-winning cooking instructor, author and television personality returns with 15 new episodes of adventures in cooking sure to entertain and educate your viewers in Joanne Weir Gets Fresh. 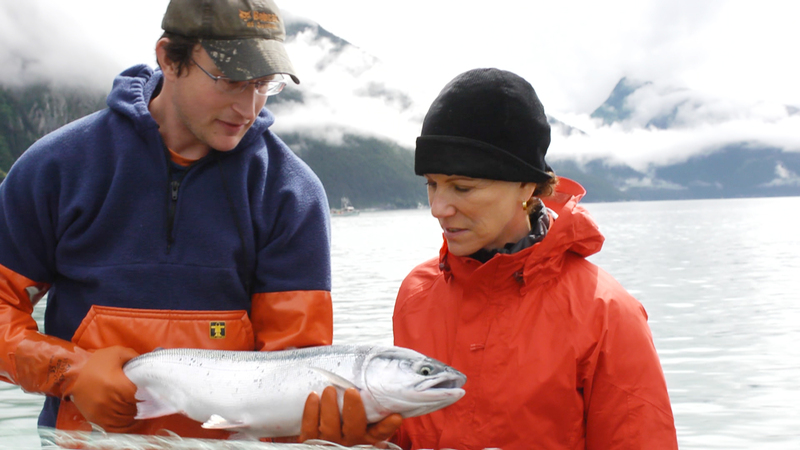 New for this series, Joanne incorporates her love of travel, taking viewers on a quest to find the perfect ingredient, whether that means fishing in Alaska, visiting a walnut orchard in California, or exploring various specialty meat and grocery markets. Have you ever thought, “I’d love to eat healthier, but I don’t have time”? Have you eyed the bounty of fresh, natural produce at your local farmers market, only to wonder how to transform all those nutritious ingredients into something easy and tasty? Lucky for us, Joanne is here to help! Using her home kitchen/studio as the classroom, Joanne provides one-on-one instruction with a real-life student, teaching both the student and viewer how to prepare creative, delicious recipes that emphasize the use of fresh, seasonal ingredients. From summer pluots, to dry farmed tomatoes and winter vegetables, Joanne takes an in-depth look at fruits and vegetables – both the familiar and the fancy- and teaches viewers how to incorporate them into easy, everyday meals. Budding cooks will appreciate the clear demonstrations and practical insights, while veteran chefs will enjoy Joanne’s creative combinations, not to mention a special visit to Alice Water’s Edible Schoolyard Project, the latest venture from the renown pioneer of the slow food movement. Member Guide Article: Why the Focus on Fresh? Joanne takes us to a classic Italian trattoria called Poggio, where Chef Ben will show us how to make fresh mozzarella. To complement the freshly made cheese, Joanne will visit an amazing fig orchard in Yountville, and then incorporate cheese and figs in her cooking lesson, making Prosciutto-Wrapped Figs with Goat Cheese, amongst other dishes. After a long cold winter, Joanne shares her excitement about green spring vegetables and herbs. She’ll incorporate those incredibly fresh ingredients into her cooking lessons with her student, preparing a Spring Panzanella Salad and a Rosemary Skewered Skirt Steak. Jasmine Rice with Lemon Zest. One potato, two potatoes, three potatoes, four! In this episode dedicated to spuds, Joanne takes us to her restaurant Copita to show us how they make her favorite dish, and follows it up by teaching her student how to incorporate potatoes into recipes such as a Sweet Potato Vichyssoise and Spiced Papas Bravas with Avocado Crema. In this episode, Joanne shows us that we don’t need to go to Morocco to get a nice variety of spices. She’ll take us on a trip to a spice shop and then teach her student how to make four different spice blends using different ingredients. She’ll also show us how to make Garam Masala and Adobo Rubbed Chicken Skewers. You won’t want to miss this spicy show! Without a root cellar to store roots year round, Joanne shows us how easy and delicious cooking with seasonal fresh root vegetables can be. We’ll visit a farm and then watch along as Joanne teaches her student how to make Root Vegetable Chips with Roasted Carrot Hummus. While Fall is typically associated with the changing colors of leaves and harvesting the last of summer produce, Joanne takes a moment to highlight beautiful fall fruit, including pomegranates and pears. She’ll also take us to a special Italian market and a Napa Winery, and teach her student how to prepare a Fall Fruit Salad. Episode 108: Corn- Get an earful! Come get an earful of corn in this episode dedicated to one of Joanne’s favorite vegetables. To take a fresh approach to incorporating corn into recipes, Joanne will travel to Alaska where we’ll visit a crab shack, and then make a Corn and Crab Chowder with her student. In this episode, Joanne goes wild with one of her secret food crushes – winter squash. We’ll visit a farmer’s market and a California walnut farm, and then watch as Joanne teaches her student how to transform winter squash into recipes including a Roasted Kabocha Soup with Ginger Butter. Joanne shares her love affair with summer, and shows us how much fun it can be to incorporate fresh summer stone fruits into recipes. She’ll instruct her student on how to prepare Stone Fruit Mostarda and a Roasted Freekeh Pilaf with Dried Figs. One of Joanne’s favorite simple pleasures in life is toasted bread and melted cheese. 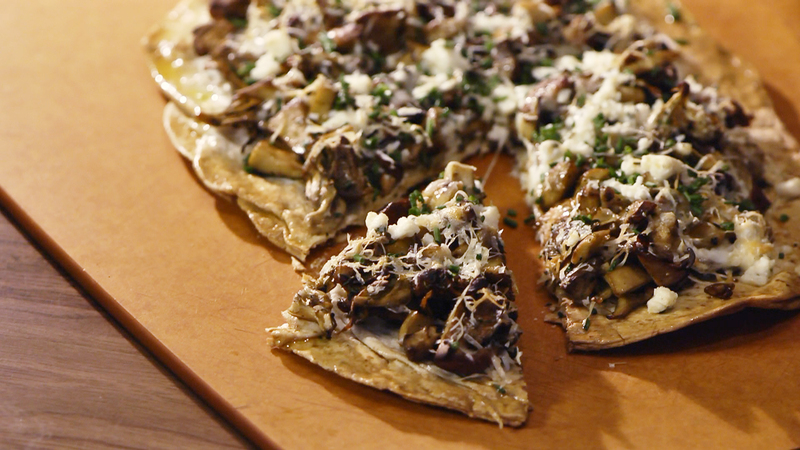 In this episode entirely dedicated to bread and sandwiches, Joanne treats viewers to a trip to Della Fattoria bakery in Petaluma, and teaches her student how to make a Piadina Salmon Melt and a “Not Your Mother’s Grilled Cheese” Sandwich. 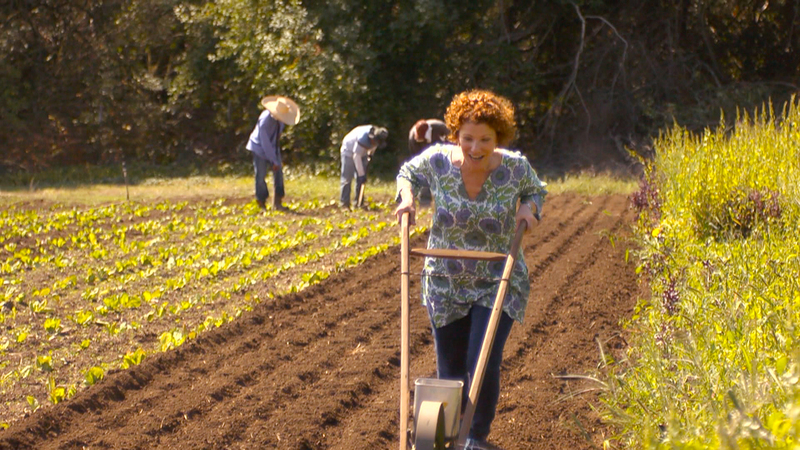 Joanne’s mother passed down her passion of beans to her, so in this episode Joanne will take us to one of her favorite farms to pick some fresh beans. She’ll also travel to an Alaskan Salmon hatchery, and then show her student how to prepare a Succotash and Maple-Mustard Glazed Cedar Plank Salmon dish. Joanne slows things down and shows us how to get two courses out of one slow cooked meal. After visiting a unique butcher shop that uses the whole animal, she’ll teach her student how to braise a chuck roast with tomatoes and red wine – perfect Italian comfort food, slow and fresh. In this special episode, Joanne takes us on a visit to her longtime friend and mentor Alice Water’s Edible Schoolyard Project. We’ll see what kind of work Alice is doing to give back to children, along with learning alongside Joanne’s student how to make a fresh Farmer’s Market Risotto with Squash Blossoms and Halibut Skewers with Pistachio-Mint Salsa. If Joanne had to pick one fruit or vegetable to be best friends with, it would be a simple, fresh tomato. Join her as she travels to Dirty Girl Produce farms and makes Fried Green Tomatoes and Bloody Marys with her student.